Isn't that a clever name for this post? Today I want to share five foyers that are from completed projects. Two of them are from a few years ago, and I'm happy to report that they're still looking as fresh as they were the day we installed them. Foyers are some of my favorite spaces to decorate. They're like a calling card to the rest of your home. Foyers provide a little introduction about what is to come, and since they're "pass through" spaces that you don't spend much time in, risk taking is encouraged - by me! You're welcome. What do you think this foyer seen above and below says about the people who live here? It's edited, collected, and proudly displays some personal items. Obviously the risk we took with the overscale abstract art paired up with the rustic bench was well worth the reward. 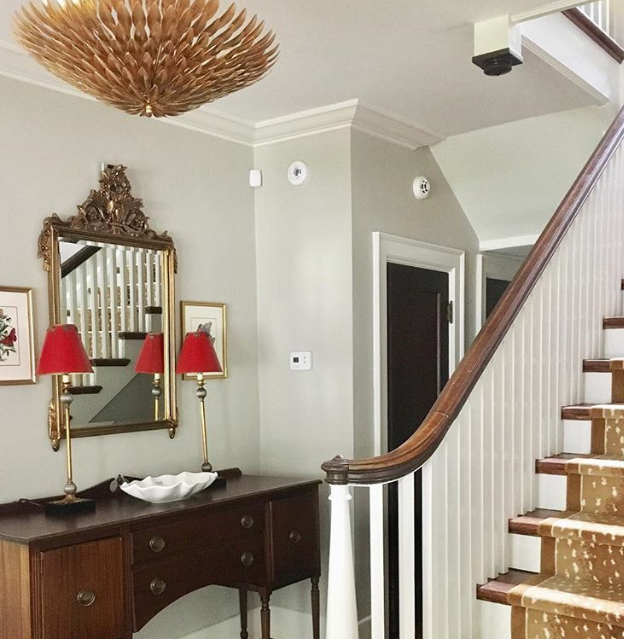 This grand foyer is timeless and chic - just like the people who live here! Can you gather a few any clues about my clients from the design of this foyer? They moved to Chattanooga from the Charleston area, and they wanted to bring some of their coastal roots to their new home. Bleached woods, organic materials and a soft color palette create a relaxed, breezy feel to their newly made over foyer. We love it! What do you think this foyer has to say about my clients? Their home is in a mountain setting and they wanted their home to reflect its surroundings. They're friendly, down to earth folks and this foyer sets the tone for the mood of their house - which is a mix of rustic, casual elegance! Side note: that painting above the console table was done by my clients' son -we had it reframed and it's the perfect personal statement! Here's another favorite project. 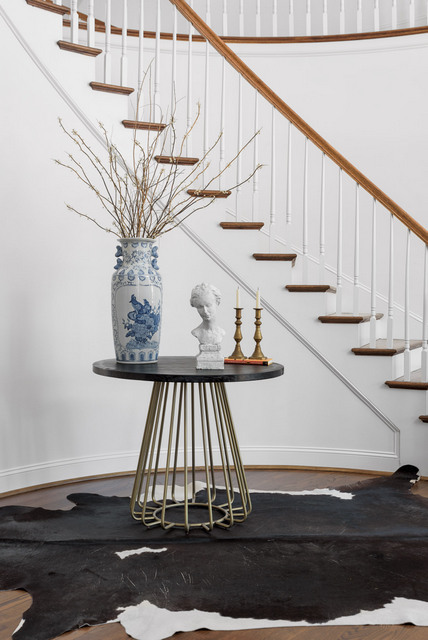 It's a foyer from an historic Colonial Revival home in Chattanooga. We took a risk with the antelope print carpet on the staircase but it's one of our favorite design elements in the entire house! Antiques , botanical prints, touches of a cheery red and a few modern touches reflect my client's happy, playful nature. I got one more for ya. This is a very recently completed project. My client loves Chinoiserie (Asian inspired) decor. It's timeless and little whimsical, which allows this foyer to perfectly represent this fun and family friendly home. A table or chest of drawers with a basket or tray provides a great place to drop keys and mail. A mirror in the foyer allows you to check your appearance before heading out the door, and it allows visitors to check themselves as they arrive. Whatever your aesthetic, nothing beats a statement light fixture . Don't settle for builder basic! Take a risk! A bold wallpaper or color choice is a great way to infuse your home with personality and wow your guests!